Rubber garage roof kits are easily installed on free standing, flat roof garages. The kits are also incredibly durable and therefore ideal for roofing applications that battle various weather conditions throughout the year and demand longevity. Our rubber garage roof kits contain everything require to fit an EPDM roof, including a Classic Bond membrane, adhesive, edge kerb, gutter drip and tool kit. 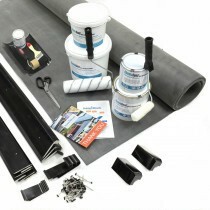 Our roof kits also include an installation guide, making it painless to install. Due to the durability of rubber membranes, you shouldn’t have to touch your garage roof for many years to come. If you have questions about our range of garage roofing kits, simply call our team on 01295 565565. We’ll help you select the right rubber garage roof kit for your project and make big savings. What’s more, with fast delivery across the UK you’ll be able to get started very soon.